Named after the Fredonia professor, violinist and academic dean, Harry A. King Concert Hall is the largest of Fredonia's five performance facilities. 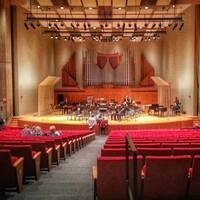 It is the primary performance location for the major ensembles from the Fredonia School of Music and the Western New York Chamber Orchestra King Concert Hall is also home to the DFT Communications Pops Series, and many convocations, and lectures. Tremendous performance. Wide variety of instrumental and vocal presentations. Very talented and surprising versatile musicians displaying wide range of historic and classical renditions. Not just a night of Sousa march music. A performance matching the venue in which they played. Very nuanced advice to the two student quartets. Amazing to me how much SINGING Canadian Brass does of their music, in their own rehearsals. They said it was sometimes up to HALF of their rehearsal time. Congratulations to Ray Stewart and the Concert Band for a delightful evening!